The Bakhshali Manuscripts, a collection of 70 odd leaves of birch bark, containing a wealth of mathematical methods, have finally been dated. The Bakhshali Manuscripts, a collection of 70 odd leaves of birch bark, containing a wealth of mathematical methods, have finally been dated. The oldest of the three samples tested was written as early as the 3rd-4th century, placing it almost five centuries earlier than where most scholars had placed the manuscripts. This makes the Bakhshali Manuscripts the oldest recorded use of a large dot, the precursor of our current form of zero. The other two fragments were dated as late 8th, and 10th century compositions, a gap of five to six centuries between the earliest one. They were clearly not written at the same time, though it is possible that the later leaves were merely copies of earlier compositions. The manuscripts were with the Bodelian library in Oxford, who had till now refused to carbon date them, as they were deemed to be too fragile. Finally, the Library and the Oxford Radiocarbon Accelerator Unit collaborate, providing a definitive answer regrading the age of the manuscript. The manuscripts were discovered in 1881 in a village called Bakhshali, 80 kilometres from Peshawar, then British India and now Pakistan. The manuscripts were written in the Sarada script and uses a language varian that is a mixture of Sanskrit, and Prakrit of the then Gandhara region. Bakhshali was a part of the Gandhara region, in which Peshawar and Taxila were important centres. Gandhara, while a part of South Asia, had influences from Greece, Persia and China. While the Indian media has called decided that the Bakhshali manuscripts are “Indian”, the reality is that we cannot project current national identities to the past. They are the joint heritage of the region as a whole. Otherwise, the Bakhshali manuscripts would belong to Pakistan, and not India, however anti-national it may sound! Without this dating, most of the historians of mathematics had placed it between 8th to 12th century. While the carbon dating may have solved this particular problem, it has created many new ones: which leaves are older and which were written later? Which of the mathematics dates back to 3rd- 4th century, which are post 5th-7th century, when we have a decisive break in Indian mathematics? Why did the Bakhshali manuscript have such a collection of leaves from different centuries, was it simply a collection used for training Buddhist merchants some arithmetic for their trade? If some of the leaves were created five-six centuries later than the earlier ones, did they simply copy earlier manuscripts, or did they also incorporate later advances? In history, as in any other discipline, an answer to a given problem, quite often opens up many more questions. Bakhshali manuscripts now become even more important, as we have huge gap between the earlier period – the sulbasutras which were composed a good thousand years before Aryabhata, and the flowering of Indian mathematics. What this dating establishes, is that the oldest recorded use of a large dot as a symbol for zero is in Bakhshali manuscripts. It is this dot notation of the zero that travelled from India into Cambodia and Indonesia, and was adopted along with other Indian numerals by the Arabs. It is this dot that later becomes the modern symbol of zero. Before the carbon dating of Bakhshali manuscripts, an inscription found in Cambodia in Old Khmer containing this symbol and dating back to the year 683 was thought to be the earliest recorded zero. The use of the dot was in the sense we use zero today, it was used as a placeholder denoting the absence of a number. In the familiar place value notation – hundreds, tens, ones (HTO) taught in the primary schools – the dot made it easy to know that there was no digit between 1 and 9 in that place. Unlike the Roman numerals, which has a symbol for every number, the place value notation initially used only 9 symbols, with their position or place to denote multiples of tens. Hence the need for a symbol showing the absence of a number in that place. The Bakhshali manuscripts show the use of place value notation including the use of the zero symbol. In this, it is not different from what existed earlier in Babylon and Meso America, both of which had place value notation and a symbol for an absence of a number. It existed in Babylon by 2000 BCE or four thousand years back, and was also found in Mayan texts in Meso Americas, again hundred of years before the Bakhshali manuscripts. They just used different symbols. While it is of historical interest to know that the currently used symbol of zero originates from the South Asian region, it is by not a surprising result, considering that it is the South Asian or Indian numerals that are the basis of the modern numerals. 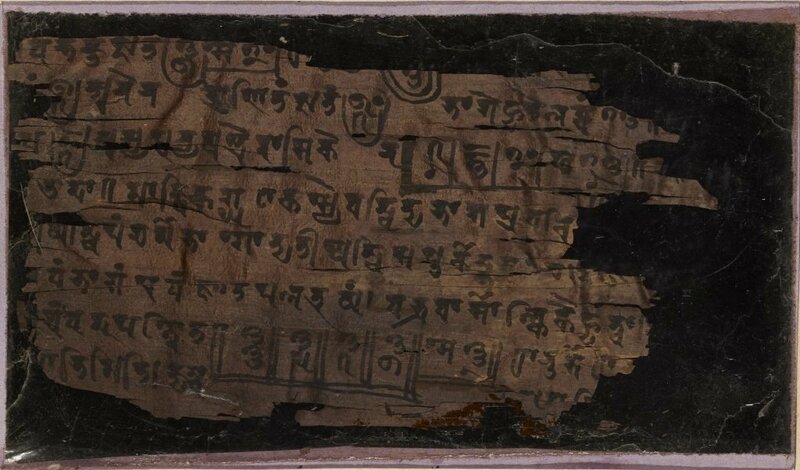 There is a lot of triumphalism in the media regarding the “discovery” of zero by India and how the Bakhshali manuscripts proves the Indians knew the use of zero from 3rd-- 4th century. These accounts confuse the use of zero as a symbol indicating the absence of number, and the use of zero as a number with which we can do arithmetic operations. The use of zero as a number came a few centirues later. The Bakhshali manuscripts establishes that the use of the current form of the symbol of zero, as a placeholder for an absence of a number, was prevalent in South Asia, travelling to different parts of the world from here. In Bakhshali manuscripts, the zero is still only a placeholder. It does not have the meaning of also being a number, with which we can do arithmetic operations such as addition, subtraction, multiplication. Bramhagupta's Bramha-sputa-sidhanta, written in the 7th century is the first recorded formulation of the rules of arithmetic with zero. Brahmagupta however stumbles on the tricky issue of division by zero, defining it to be the same as multiplying by zero. Bhaskara II in the 12th century, suggested that the result of any number divided by zero is infinity, a formulation that was accepted by mathematicians for the next seven centuries. Even great mathematicians of the 18th century, such as Euler, accepted that any number divided by zero was infinity. It is only when mathematics was put on a systematic logical basis at the end of the 19th century that the “problem” of division by zero was finally “solved” – it was declared illegal, or an undefined operation! The unique contribution of the South Asian region is not creating the modern symbol of zero, but the use of zero as a number with which we can do arithmetic operations. This is the decisive break in mathematics. It brings is zero into the family of numbers, not merely as an absence of a number but also member which it is also possible to treat as a member, though somewhat unusual one. It opened mathematics to negative numbers, indeed the entire domain of negative mathematics. Negative numbers made a number of leading mathematicians deeply unhappy as late as 18th century. Descartes and Pascal both denied negative numbers could exist. Philosophically, they could not accept negative numbers, as negative quantities – e.g., minus three apples – do not exist in nature. They were only accepted grudgingly as a useful mathematical device. In the history of mathematics, there is also lessons to be learned on how not to deal with knowledge. Fibonacci, who had extensive contact with Arab merchants, was the first to popularise the indian-Arab numerals in Italy in the 12th century. It made accounting, a major task for the merchants, much more easy. A number of cities in Italy banned these “foreign” invasion of numbers, delaying the growth of science and mathematics in Europe. It was only after the introduction of the printing press that the Indian-Arab numerals became widely used. This history is a warning to the current dispensation, who would, like medieval Italian towns, erase foreign invasions from Indian history. It is Brahmagupta's rules of arithmetic, followed by Mahavira's and Bhaskara that created the foundation for the modern number system. It starts by adding negative numbers, and later, imaginary numbers into the number system. Mathematics thereby was stepping beyond what are simple reflections of quantities in nature, and creating its own universe. The power of this universe is that it feeds back into science, enhancing further our understanding of nature. Without the mathematical universe and the tools it supplied for the sciences, the great advances in science would not have been possible. This is the power of the zero, not a simple sunya or an absence, but a number in its own right.